Fill out the form below to get a free copy of this groundbreaking new report - available to non-members for a limited time. More resources available at i4cp.com. 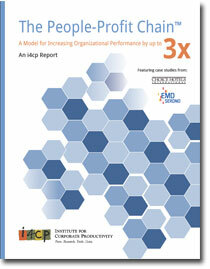 What if your organization could increase its performance by up to 3x? While there exists no shortage of models that connect people practices to business results, what’s been lacking is evidence. Introducing the People-Profit Chain™.